I was really excited to check on my starter this morning, because after the activity yesterday, I was sure that it would double in size overnight. Wrong. Today it looked about the same as yesterday. Yes, it did bubble and grow a bit after feeding it last night, but it never grew past the level it reached on day three. In The Bread Baker’s Apprentice, Peter Reinhart says to let it sit out at room temperature for an extra 12 to 24 hours if it hasn’t doubled in size on day four, but it seemed to me that the poor thing probably wanted to be fed on schedule. So I went ahead and dumped out half of the contents of the jar, mixed the remaining starter with 1 cup of unbleached all-purpose flour and half a cup of filtered water. I poured it back into the clean jar, adjusted the rubber band to mark the level, covered it, and crossed my fingers. Tomorrow we’ll delve a little more into the world of sourdough. I’ll tell you more about what’s actually happening in this jar of mine and what we can do with it once the starter has matured. Thanks for following along on this little adventure! 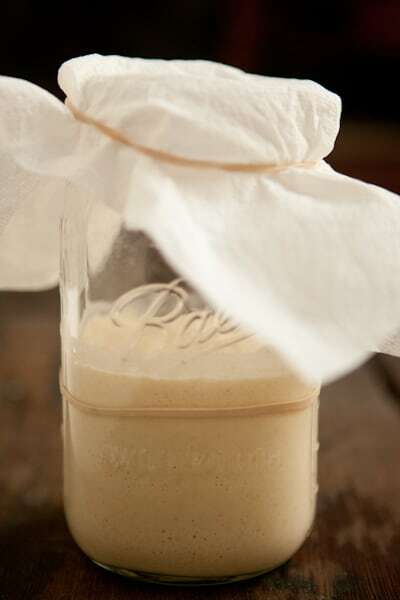 Want to create your own sourdough starter? Day One: In a small bowl, mix one cup of whole wheat or whole rye flour with 3/4 cup (6 oz) canned pineapple juice (at room temperature) until all of the flour is hydrated. Scrape mixture into a quart-size wide mouth glass container, such as a jar or glass measuring cup. Mark the level of the starter with a piece of tape or rubber band. Cover the container with a paper towel, cheesecloth, or coffee filter and secure with a rubber band. Leave at room temperature for 24 hours. Day Two: You probably won’t notice much change at this point. Scrape the contents of the jar into a mixing bowl and add 1 cup of unbleached all-purpose plus 1/2 cup pineapple juice (make sure juice is room temperature). Mix until all ingredients are evenly distributed. Wash and dry your glass container and scrape the mixture into the container. Mark and cover the container just like day one. Let sit at room temperature for 24 hours. Day Three: You may notice some activity at this point. The mixture may have risen some and there might be bubbles. Regardless of whether you notice any fermentation or not, discard half of the mixture (or give it to a friend to cultivate), and mix the remaining half with 1 cup of unbleached all-purpose and 1/2 cup filtered water (make sure water is room temperature). Wash and dry your container and scrape the mixture into the container. Mark and cover as before. Let sit at room temperature for 24 hours. Day Four: The mixture should have at least doubled in size at this point. If it seems to be sluggish and hasn’t doubled in size, allow it to sit at room temperature for another 12 to 24 hours. Otherwise, repeat instructions for Day three. Day Five: Feed the starter (repeating day three instructions) first thing in the morning and then again in the evening (about 12 hours apart). Day Six: If your starter has been very active and always doubles in size (or more) between feedings, then your starter is ready to bake with. You may also choose to refrigerate your starter at this point and slow down the feedings to once a week. If you’d like to bake some bread, here is a basic sourdough bread recipe to get you started. If your starter still seems a little sluggish, continue with the twice daily feedings as above. Day Seven: Same as above. Day Two: You probably won't notice much change at this point. Scrape the contents of the jar into a mixing bowl and add 1 cup of unbleached all-purpose or unbleached bread flour plus 1/2 cup pineapple juice (make sure juice is room temperature). Mix until all ingredients are evenly distributed. Wash and dry your glass container and scrape the mixture into the container. Mark and cover the container just like day one. Let sit at room temperature for 24 hours. Day Three: You may notice some activity at this point. The mixture may have risen some and there might be bubbles. Regardless of whether you notice any fermentation or not, discard half of the mixture (or give it to a friend to cultivate), and mix the remaining half with 1 cup of unbleached all-purpose or bread flour and 1/2 cup filtered water (make sure water is room temperature). Wash and dry your container and scrape the mixture into the container. Mark and cover as before. Let sit at room temperature for 24 hours. Day Four: The mixture should have at least doubled in size at this point. If it seems to be sluggish and hasn't doubled in size, allow it to sit at room temperature for another 12 to 24 hours. Otherwise, repeat instructions for Day three. Day Six: If your starter has been very active and always doubles in size (or more) between feedings, then your starter is ready to bake with. You may also choose to refrigerate your starter at this point and slow down the feedings to once a week. If you'd like to bake some bread, here is a basic sourdough bread recipe to get you started. If your starter still seems a little sluggish, continue with the twice daily feedings as above. *The reason I suggest filtered or bottled water is that chlorinated water straight from the tap might make it more difficult for your starter to get going. 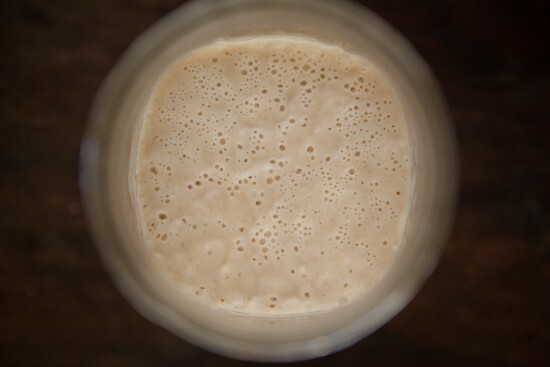 Some people have had no trouble using filtered water, but if you're going to invest the time in creating a sourdough starter from scratch, why take any chances? I filter my tap water through a Brita water pitcher. Any cheap bottled water would be fine, too. The only thing we're trying to avoid is chlorine. If you know that your tap water is not chlorinated, feel free to use it without filtering it. Wow sourdough is so technical. This reminds me of when you grow a bean in the second grade :) Can't wait to see how it turns out! i have been making sourdough bread for 2 years now, and have found that the most critical difference is which type of flour is used. The strongest bread flour gives the best results, the best i have found is Canadian Vienna Spring, known as "silk flour". Brown flour gives a very solid result and rises very slowly. Sometimes i have cheated when the starter is sluggish and i need a loaf, and i add 1tsp sugar to the dough! Happy sourdoughing...there is nothing else quite like it! Nicole, this is terrific! I don't comment here as much as I should, but I read your blog regularly! (And p.s. you totally deserve the recognition on Food52 for best of blogs this week, kudos!) When my son was an infant, I had what I called "my science project" going. I used organic grapes in a bowl of slushy flour and water (ooh, messy!) It did work, eventually, but I like this method much better. When I couldn't deal with it anymore, I spread my starter out in a thin sheet and dried it, then reconstituted it later. I have lost track of those results, though :) I am an avid bread baker. I make Jim Lahey's bread in a pot just about every week (once the weather cools down) but I think it's time to revisit the science project, with your help. Look forward to reading more! I started my sourdough starter again 3 weeks ago, and I used the method I found on Michael Ruhlman's website. Basically, you wash some organic grapes in a bowl of warm water then add flour to the warm grape washing water. I had a strong starter going in 2 days. Humm it looks so great! I will try to start the recipe tonight, it seems long but worthy! I did everything Iwas supposed to .The only problem I had was when I had to seperate the dough into 2 pieces and then let then sit. they never rised and thee bread was thick and heavy. Teaste was good but why didnt it rise? After you have starter that you are using, do you ever add pineapple juice,like when you divide to bake, to your "new" starter?